Baron Lansberg, Paris; sale Paris (?). Baron August Janssen, Brussels, 1910; Frederik Muller, Amsterdam, 26 April 1927, lot 85 (Dfl. 500). with Jacques Goudstikker, Amsterdam, by 1927. C. Hofstede de Groot, Beschreibendes und kritisches Verzeichnis der Werke der hervorragendsten Holländischen Maler des XVII Jahrhunderts, Stuttgart/Paris, 1907-28, III, no. 172. W. Martin, Catalogue de la Collection de peintures du Baron Janssen, Brussels, 1923, p. 126, no. 85. C. Wright, Paintings in Dutch Museums. An Index of Oil Paintings in Public Collections in The Netherlands by Artists born before 1870, London, 1980, p. 355. Old Master Paintings: An illustrated summary catalogue, Rijksdienst Beeldende Kunst (The Netherlandish Office for the Fine Arts), The Hague, 1992, p. 232, no. 1998, illustrated. Rotterdam, Rotterdamsche Kunstkring, Catalogue de la Collection Goudstikker d'Amsterdam, 11-26 June 1927, no. 52. Amsterdam, Catalogue des Nouvelles Acquisitions de la Collection Goudstikker, October-November 1927, no. 98. We are grateful to Dr. Hiltraud Doll for confirming the attribution after inspection of the original (verbal communication, 27 September 2007). She dates the picture to circa 1636. We are also grateful to Professor Schnackenburg for confirming the attribution on the basis of a photograph (written communication, 3 September). 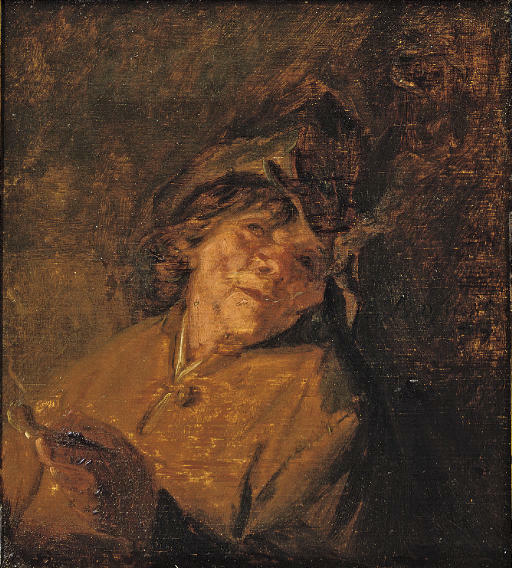 Van Ostade recalls his teacher Adriaen Brouwer in this vibrant study. Van Ostade was well known for such studies of which two (one dated 1642) can be found in the Boijmans-van Beuningen, Rotterdam and one (c. 1646) in the Rijksmuseum, Amsterdam. Professor Schnackenburg believes this panel to be an early sketch, datable to circa 1637 and relates it to the artist's pen sketches.